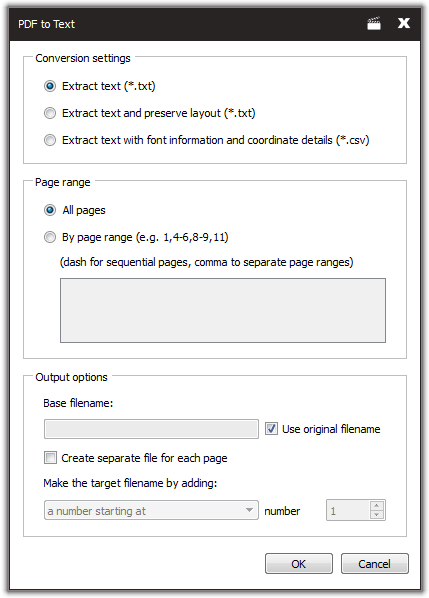 Debenu PDF Tools Pro lets you extract text, embedded fonts and embedded images from PDF files. Debenu PDF Tools Pro can extract text in several different ways. You can extract human readable text without any formatting, extract text with the page layout preserved or extract text along with font information and exact co-ordinates for the text. Extracts all fully embedded TrueType fonts from a PDF. Fonts are saved to disk. Font must be embedded in the PDF and cannot be an embedded subset of the original font. Extracts all embedded images from a PDF to the corresponding image format. Images are saved to disk in the original image file type where possible.